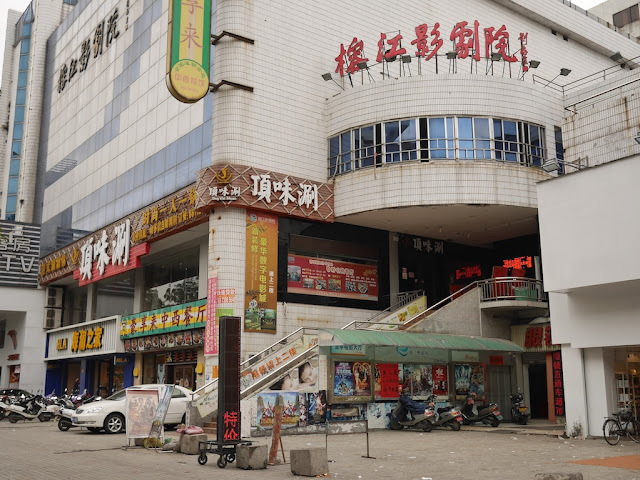 Nothing seemed out of the ordinary when I approached a shopping center in Jieyang today, including the various obstacles in my path such as the motorbikes, the common-in-China stools, or signs indicating a bank's dedicated parking area. So as I walked to get a closer look at a storefront sign, I effortlessly weaved my way without much thought. But then suddenly I had a sinking feeling. Soon I was reminded of two important lessons about life. 1. How you make an impression on the world often happens in ways you don't expect. 2. You won't be the only person to leave an impression. On a more pragmatic note, I'm mildly pleased I decided to wear a worn out pair of shoes a bit longer despite having already purchased a replacement pair. 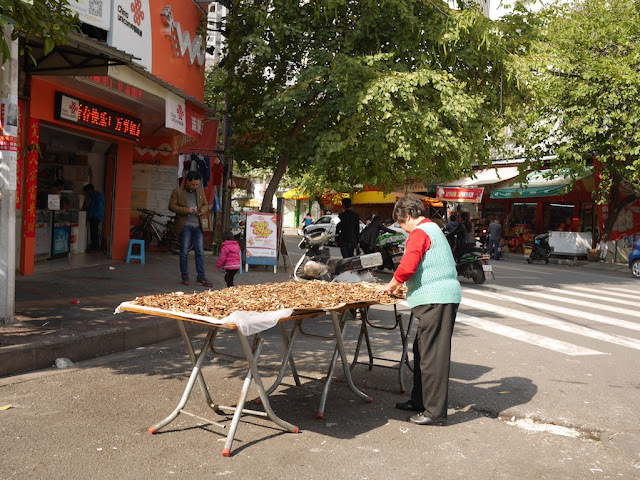 After a number of cloudy days Jieyang, today's clearer skies inspired some to head outdoors. After all, the weather was good for sunning your fish. 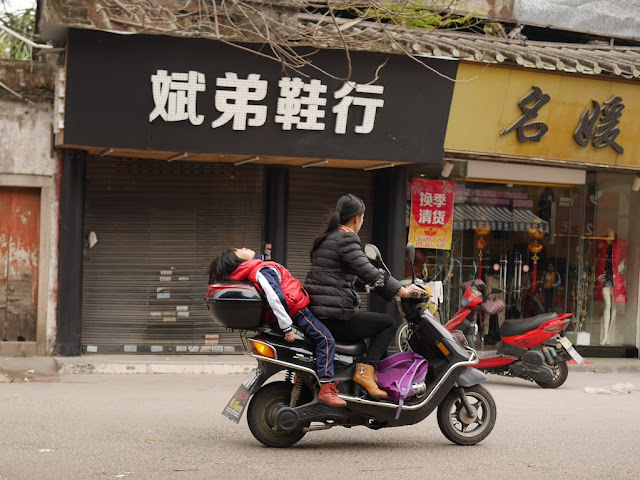 Last year I was impressed by a man sleeping on a motorbike in Hengyang, Hunan. 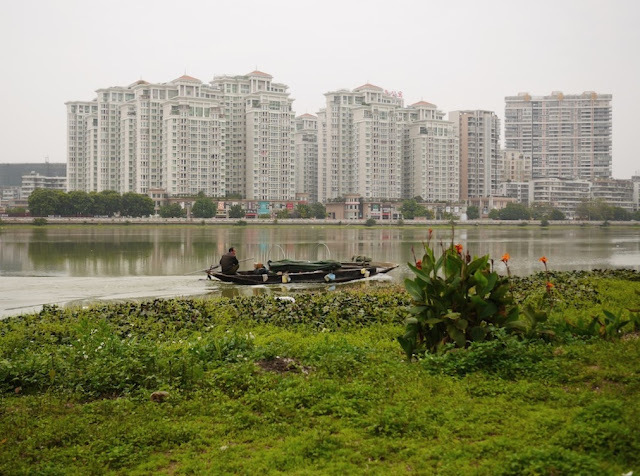 Today in Jieyang, Guangdong, a similar sight zipped by. Despite the closed eyes, though, the apparent grip on the side of the motorbike makes me question whether the child is asleep. Either way, it was a reminder there is nothing like an early afternoon nap. 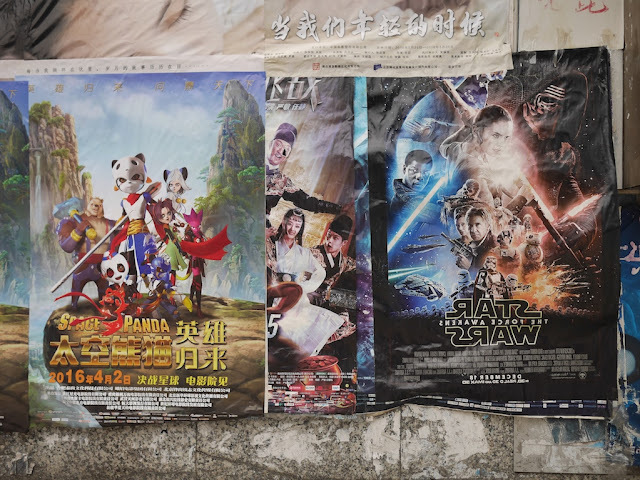 Today in Jieyang I didn't see a goat. But I did see a boat. Yesterday was my first day in a while not to see a goat in Jieyang. But thanks to two readers, it wasn't an entirely goat-free day for me, though, so I will briefly return to the goat topic. One reader asked "What's with all the goats?" 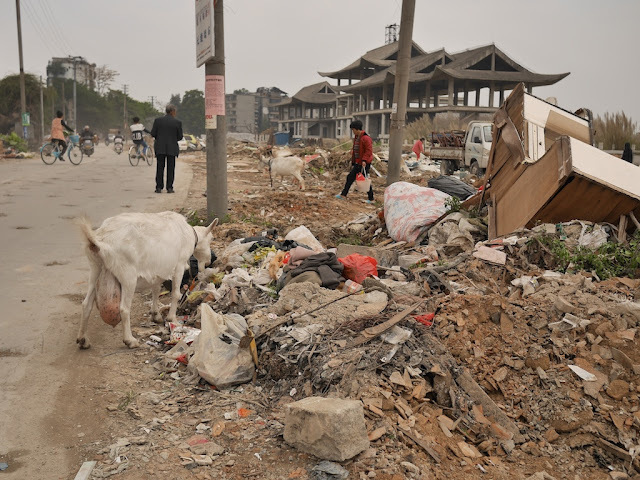 To be clear, Jieyang isn't overflowing with goats. The examples I have shared were isolated incidents during days when I covered much ground. After showing a goat-milking photo to one local, she said she didn't think it was common. That's been my impression as well. 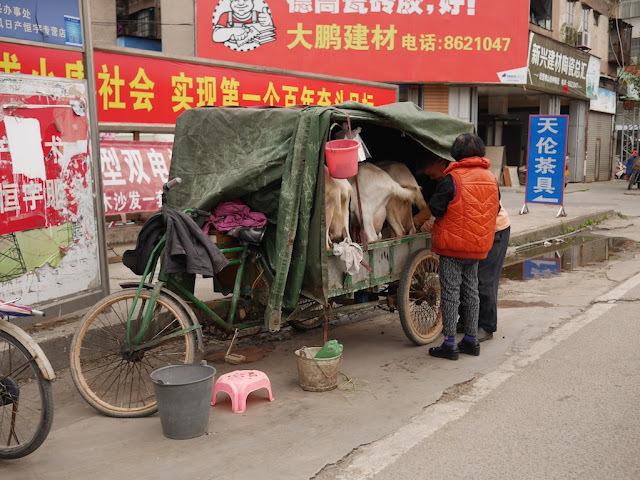 But I have seen far more goat milking on Jieyang's urban streets than anywhere else in China. The other reader shared some rather unfortunate goat-related news. 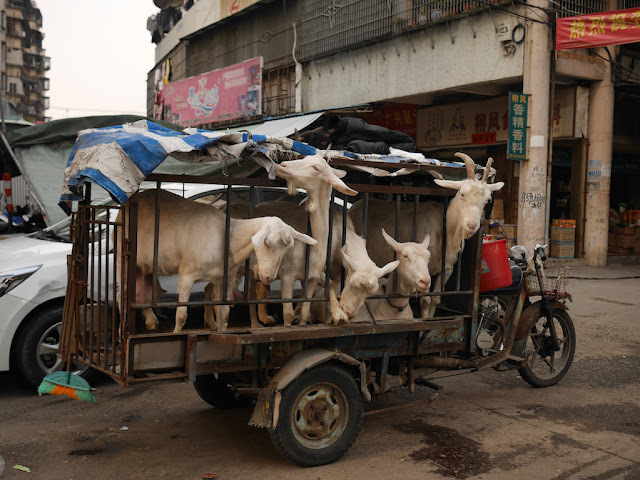 300 goats recently burned to death on a truck which caught fire near its destination in Liuzhou, Guangxi. 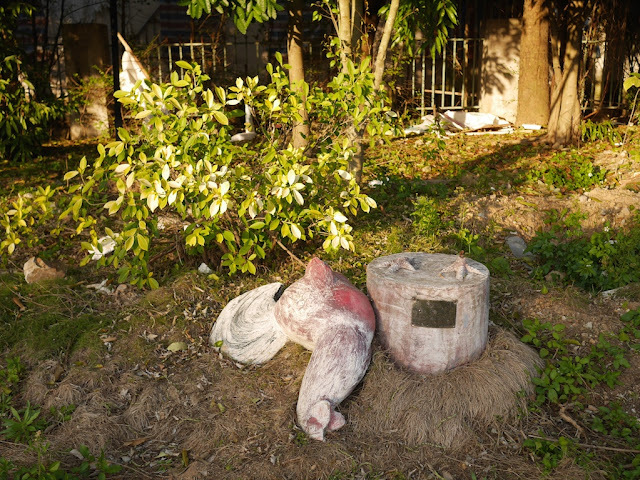 I won't be sharing the graphic photos of the fire and its aftermath, but Shanghaiist has them. The incident is terrible regardless, but I wonder where the goats were headed. I doubt it was a petting zoo. To end this post on a cheerier note (not a high bar there), I will sneak in another photo of goats on wheels, this one from today. It provides more food for thought regarding the goats' diets. One goat was munching on the tarp covering its cart. The tarp was one of several clues including the vehicle, the broom, the bucket, and, of course, the five goats which give me the confidence to declare these are the same five goats I saw speeding down the road earlier this week. As far as I can tell, this is my first repeat sighting. I will take it as further encouragement to move onto other topics. 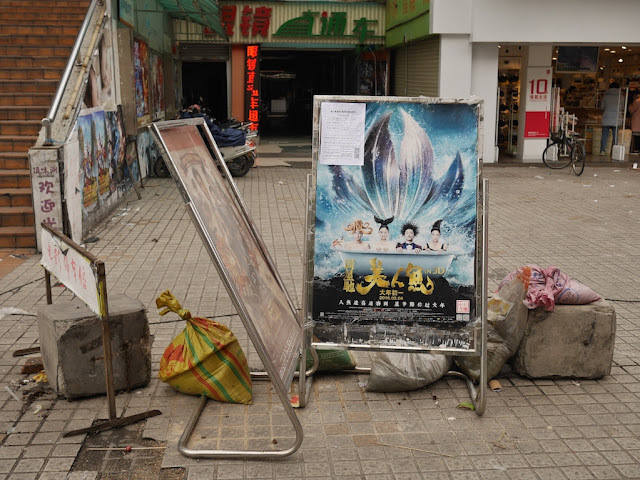 I hadn't planned on a series of posts about unexpected goat sightings in Chaozhou and in Jieyang. 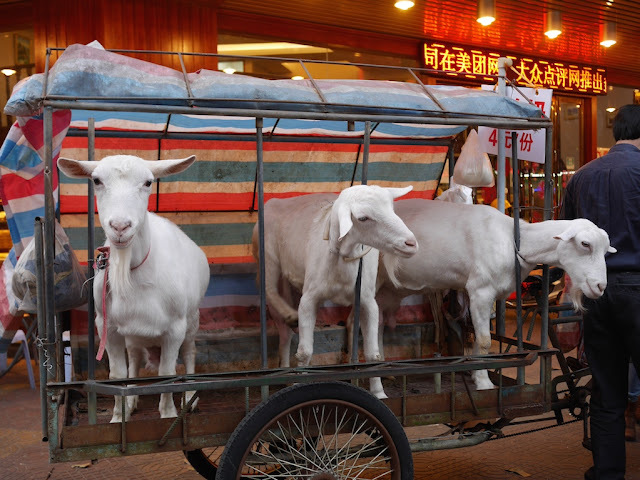 I figured the last post about the motorbike tricycle cart with an impressive five goats would be hard to top and looked forward to moving onto other matters. 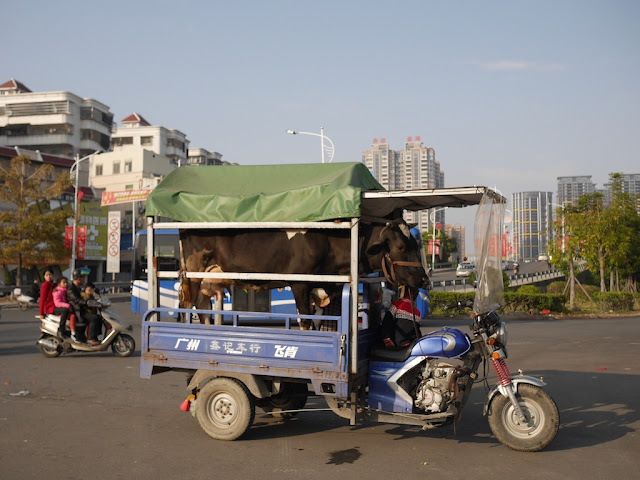 So even though I saw an electric/pedal-powered tricycle cart with five goats yesterday in an urban area of Jieyang . . .
and saw a milking for a customer . . . I probably wouldn't have shared more goat photos today. 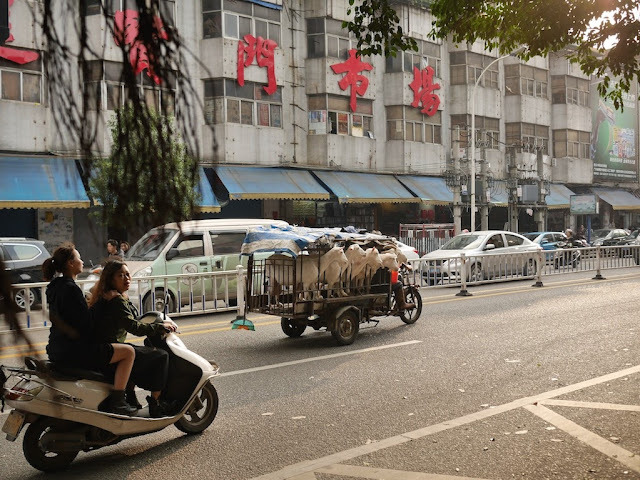 But nearby on Ronghu Road, I came across something which made me feel, yes, another goats-on-wheels post was clearly justified. One cart. Seven glorious goats. Barring seeing something like a school bus filled with goats, which at this point I wouldn't discount, this should conclude the series. 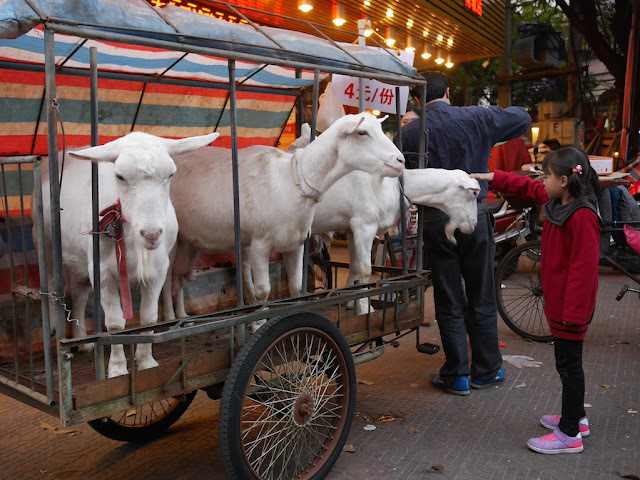 I will have something to say, though, about a fate for goats in Jieyang less grand, at least from a goat's perspective, than being milked or riding carts. 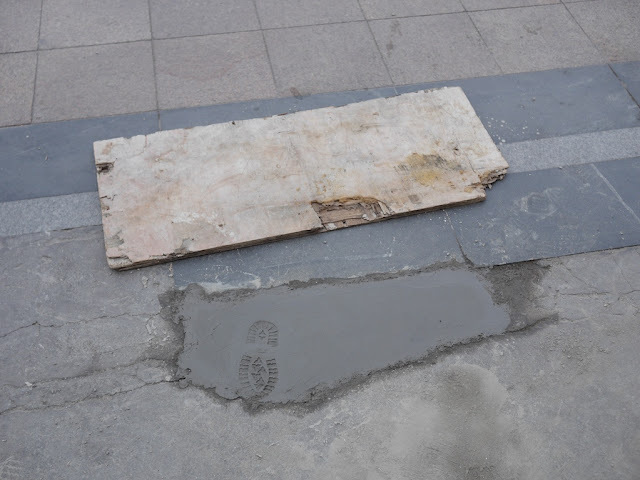 While taking a series of photographs of a scene at Jinxianmen Avenue in Jieyang yesterday, something else deserving to be captured caught my attention. I was ready with my camera, but unfortunately the arrangement of vehicles on the road was not conducive to a clear shot. But as the vehicle of note sped away there was a break, and I caught the moment. 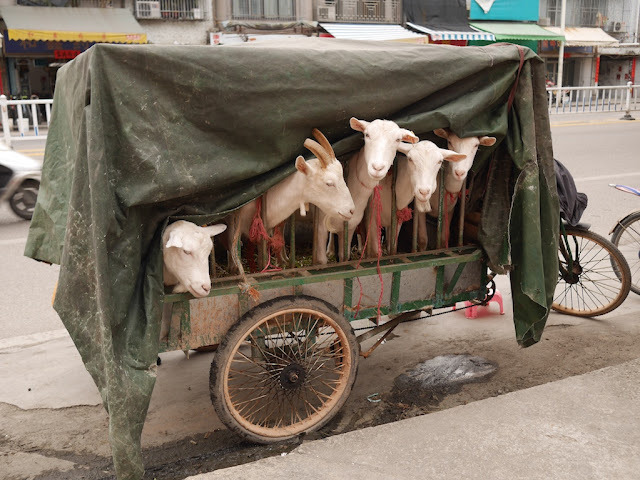 After briefly looking at the small image on my camera, I thought it was a motorbike tricycle cart with four goats — topping the previous carts with goats in Jieyang and in Chaozhou. When I later looked at the photo, I realized it was something even greater, as can be more easily seen in a cropped version of the photo. Yes, make that five goats — all with a view. The goat appearances didn't stop there. 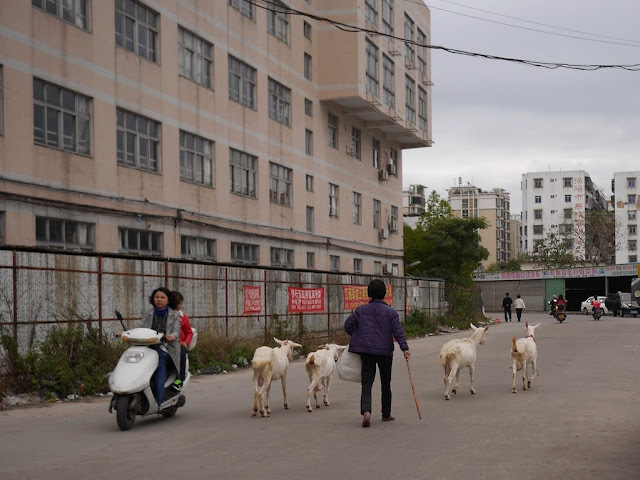 Today near Donghu Road while I had been thinking about matters other than goats, four more goats passed by. 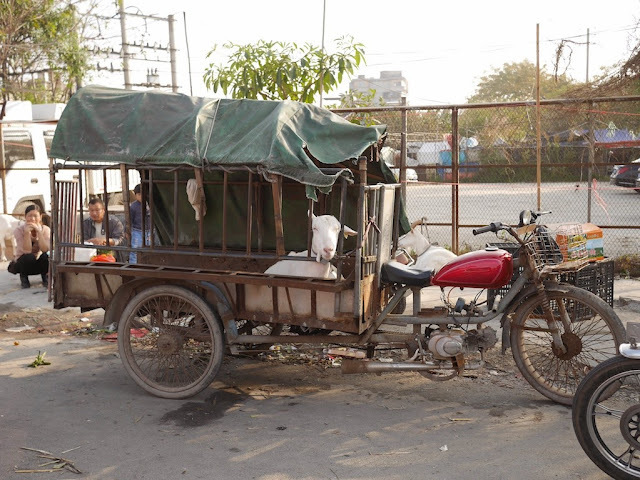 And for the first time in my life, I was surprised to see goats because they were not on a motorbike tricycle cart. 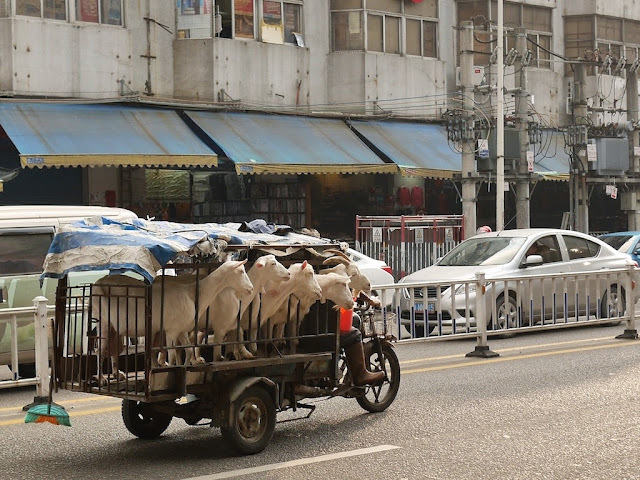 Like before, all of these goats were spotted in urban areas. These are exciting days indeed. 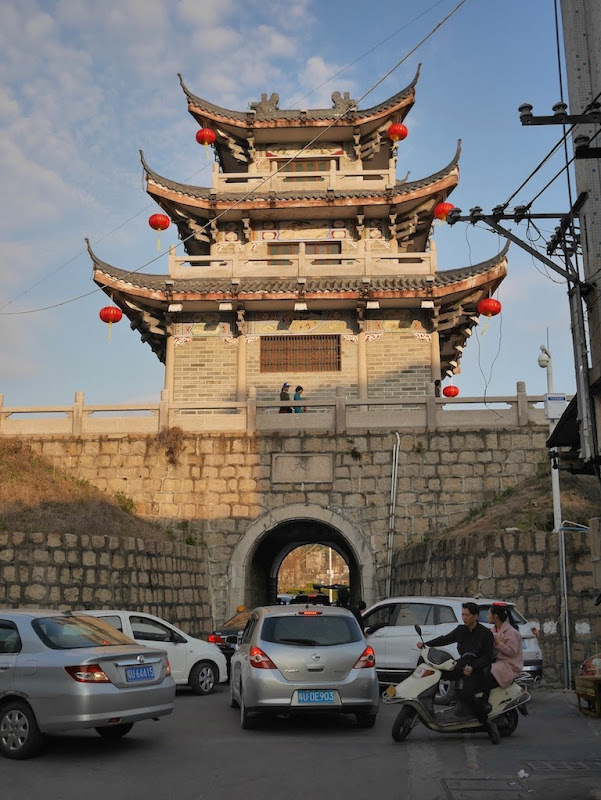 Chaozhou and Jieyang, bordering cities in eastern Guangdong province, share much in common. 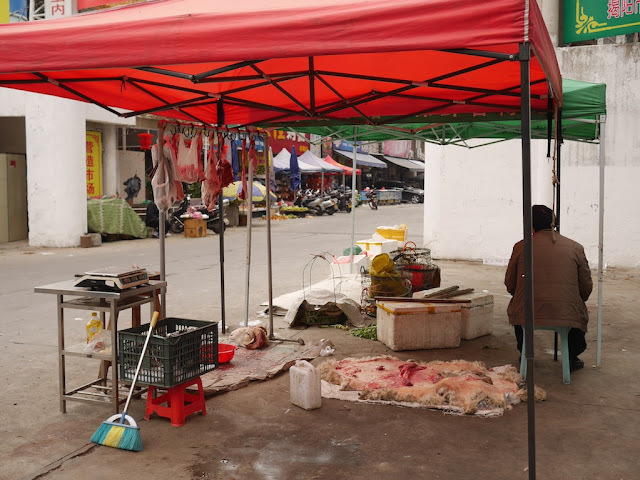 So after recently seeing fresh goat milk for sale in Chaozhou, I wasn't entirely surprised to see a similar arrangement yesterday at a street intersection in Jieyang. 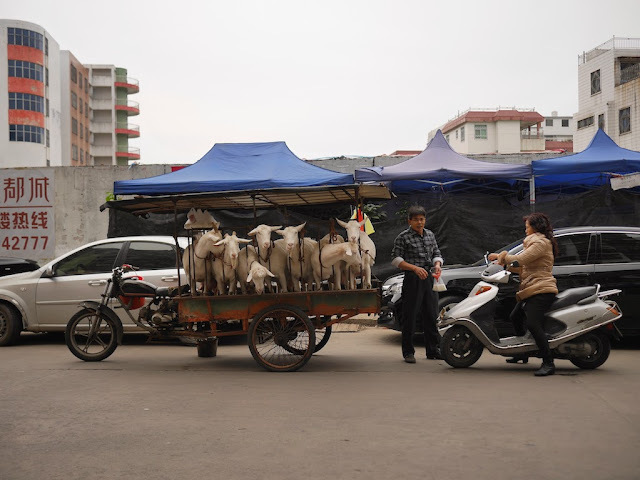 Like the milk seller in Chaozhou, the tricycle cart carried three goats (in the above photo two of the goats are off the cart mostly out of view). 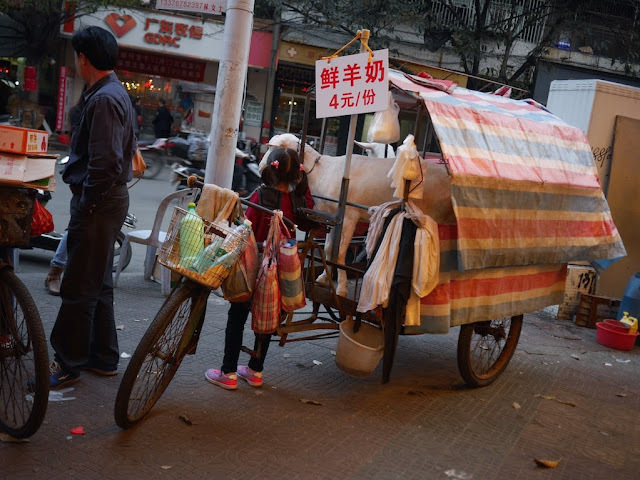 Unlike the milk seller in Chaozhou, the tricycle cart had a motorcycle front end. Nearby, another seller offered offered milk from a more common source. While there, I was fortunate enough to witness a milking for a customer's order. Having grown up in an area with many farms, I have seen plenty of cows before. I haven't seen many on motorized tricycle carts in the middle of urban areas though. 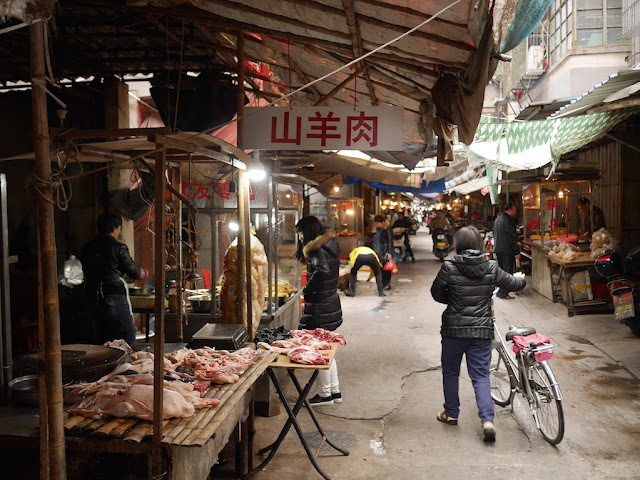 With concerns about fake products and past milk scandals on the minds of many in China, even inspiring cross-border trips for milk products, it is easy to think of reasons why this option would appeal to some people. Questions remain pertaining to the milk's quality, including ones about the animal's diet, but there is no doubt about its source, its freshness, or whether anything was added after it left the animal. 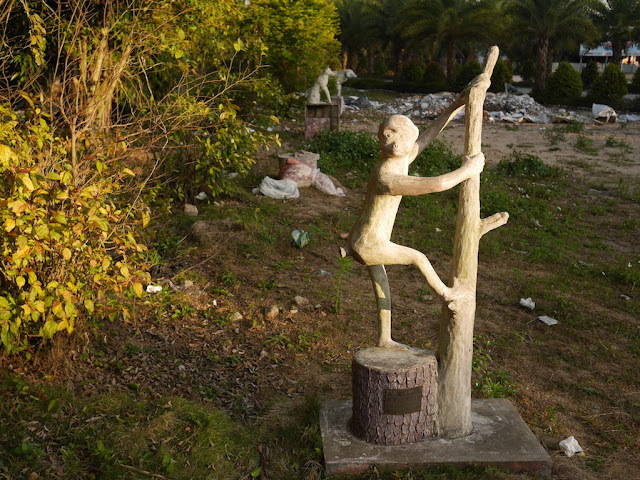 A neglected portion of Fenghuangzhou Park (凤凰洲公园) in Chaozhou holds statues for all the animals of the Chinese zodiac. 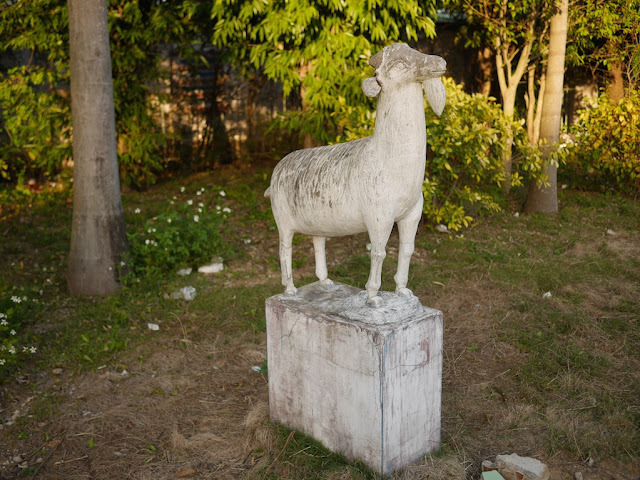 Yesterday, on the last day of the Year of the Yang, the goat statue stood proud. Hanging out nearby was the statue for the new lunar year's animal. I'm don't know what is planned for this portion of the park. It seems to hold some potential despite its curious current state. 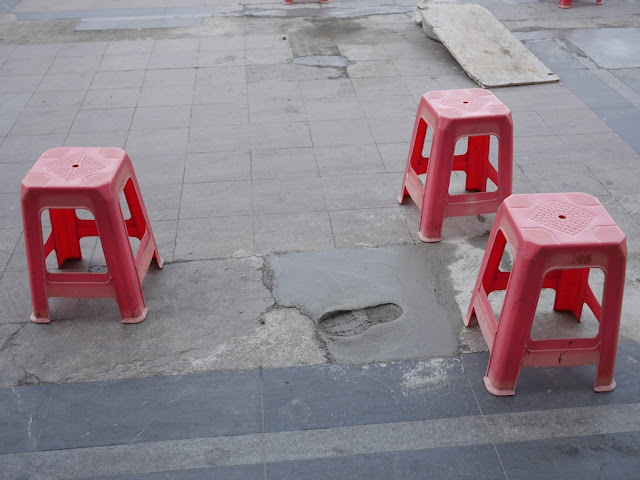 But hopefully they at least address one mishap before next year — the Year of the Rooster. Not only did I see three goats yesterday, three goats saw me. And a girl petted one of them. They weren't part of a mobile petting zoo though. 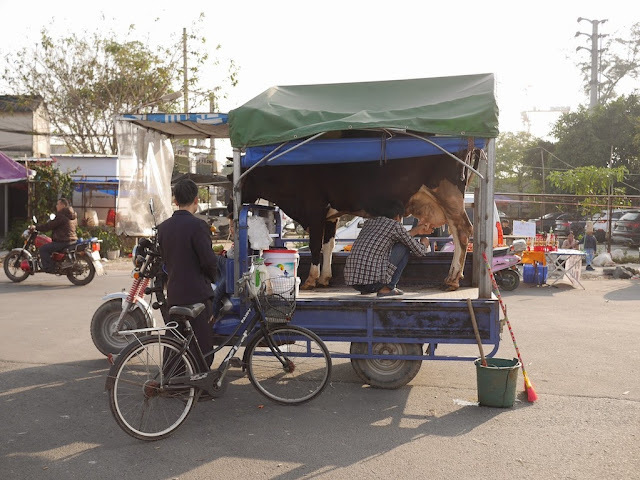 Instead, the man who had biked them there was selling fresh goat milk. 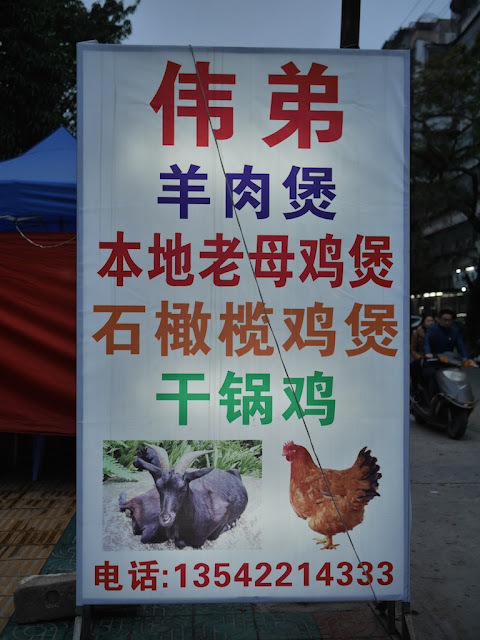 It seemed to be an auspicious sign to see goats on the second to last day of the Chinese lunar new year. 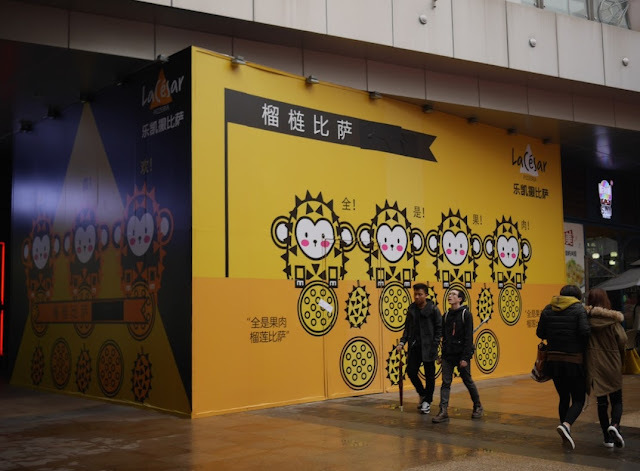 There was much debate over which animal was represented by 羊 (yáng) — the Chinese word for the year's zodiac symbol. It can refer to a range of animals related to sheep and goats, and additional characters are sometimes used to remove any ambiguity. 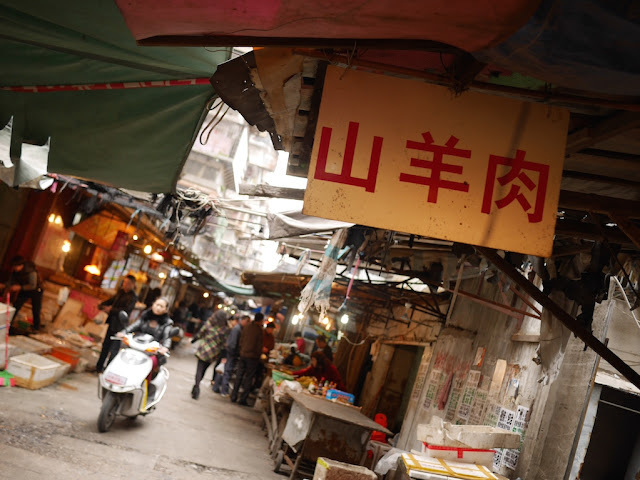 In this case, though, the seller apparently felt that 羊 would be understood as "goat", not so surprising since we were in Chaozhou — a city in southern China. Of course, if there was any doubt, the nearby goats cleared things up. Although I had questions about the whether the milk was safe, I figured I couldn't pass up the opportunity to end the year in such a fitting fashion. So I told the man I was interested in making a purchase. After discussing the amount of milk I wanted, he asked what I intended to do with it. After I told him I planned to simply drink it as is, he explained that wouldn't be a great idea. The man with the goats had spoken. And he had passed up a sale in order not to bring me any harm. I thanked him and left milkless but appreciative I didn't end the year on an unpleasant note. 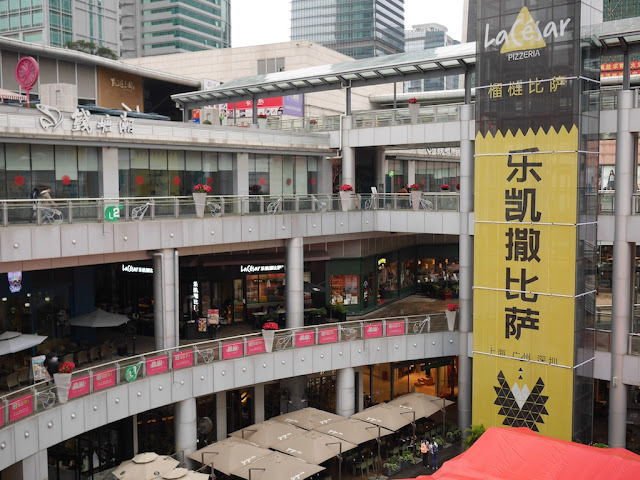 I recently saw many examples of luggage sales at the Dongmen shopping area in Shenzhen. 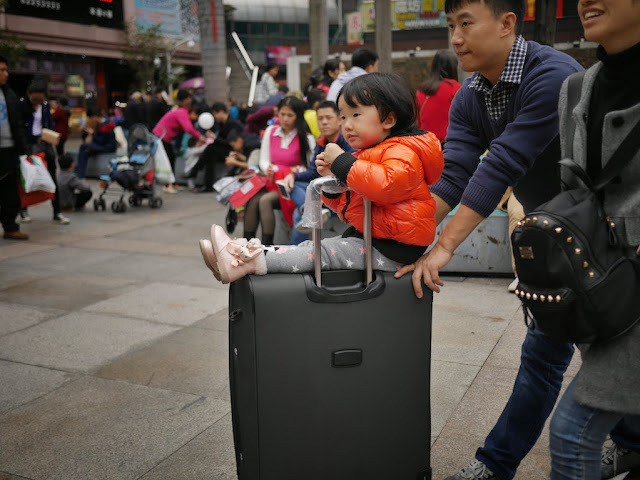 Most buyers likely planned to use their new luggage for the upcoming Lunar New Year holiday. I saw one example, though, of a more immediate benefit. For what it's worth, my first exposure to durian was in ice cream. I didn’t like it. I also tried durian muffins — also not so good. I then discovered that I do quite like plain durian — so long as we’re outside and the smell can dissipate. I had previously wondered whether treats such as a durian ice cream could be a way for more people to gain an appreciation of durian. The reader's experience made me question that, though the unenjoyable treats may have primed him for a more pleasurable first experience eating plain durian. Perhaps if he revisits the muffins he may now have a different impression. It is also worth noting that people can have strong preferences for a specific durian variety, of which there are many. There are so many variables to consider, but at least the reader's story has a happy ending. He may be heartened to learn I ate the strong-smelling durian pizza outside. As planned, I ate the leftover durian pizza at room temperature (inside) for breakfast. I must say, it was a great way to start the day. I now see durian pizza in a new light and am wondering if I could get a durian pizza delivered in the early morning — with extra durian, of course. 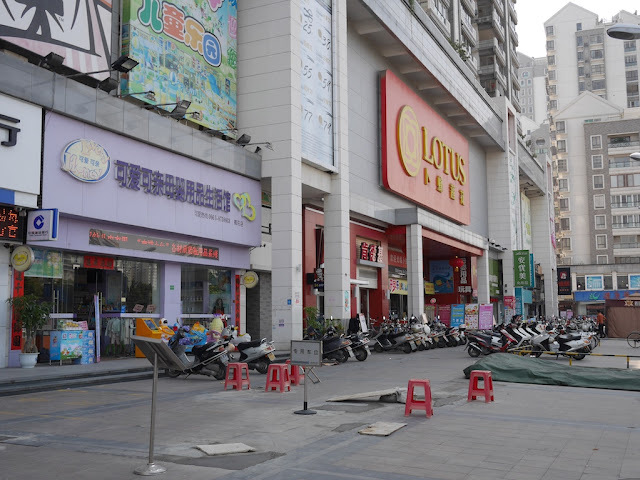 During recent days at the Dongmen shopping district in Shenzhen, lint removers were obviously not the only item in demand. One item in particular stood out. 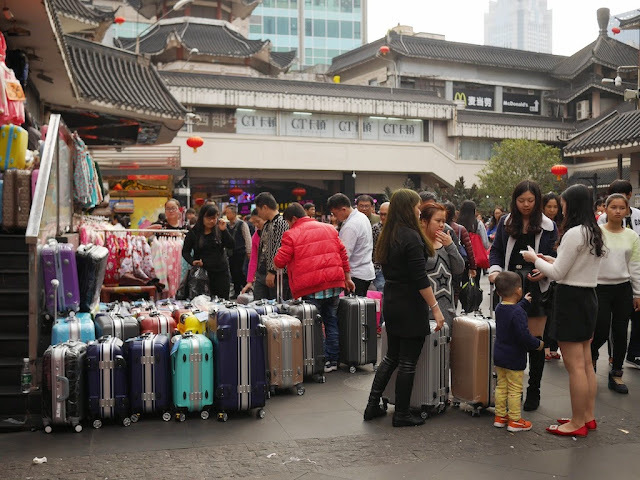 So many people walked around with pieces of newly purchased luggage, one could wonder whether the world's biggest annual human migration is underway in China. It is. 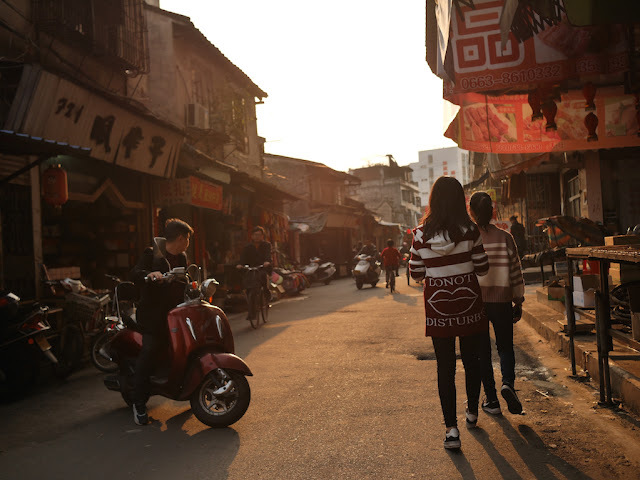 During a 40 day period surrounding the Lunar New Year, Chinese travelers are expected to take 2.9 billion trips. Notably, that's 700 million trips less than last year. 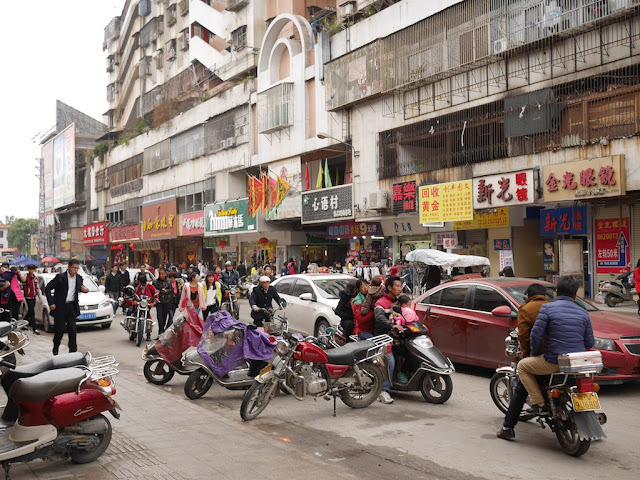 Yesterday, travelers in nearby Guangzhou experienced some of the pains which occur when transporting all of those people doesn't go as planned. Due to bad weather far to the north delaying trains, thousands were stranded — figures range from 38,000 to 100,000. 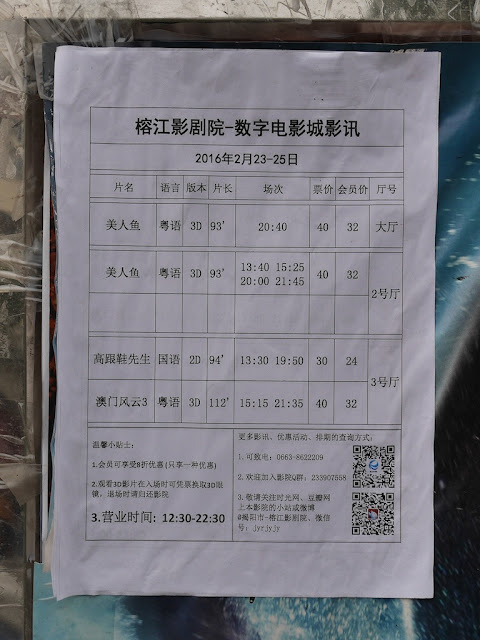 Part of the discrepancy may be due to some figures including Guangzhou East Railway Station. Whatever the case, it was a lot of people and probably a miserable experience. Yesterday, I made my own journey. Due to my unexpected return to the area and staying in Shenzhen longer than planned, I was not able to buy a train ticket in advance. They were sold out, so I took a bus at roughly twice the cost — partly attributable to the bus company's willingness to raise prices for the holiday. The bus ride lasted over 6 hours instead of the 2 hours possible on a high speed train, though that doesn't factor in the bus stations' more convenient locations. I am not complaining, though, even with the many unexpected detours the bus took to pick up more passengers. I made it to my destination. 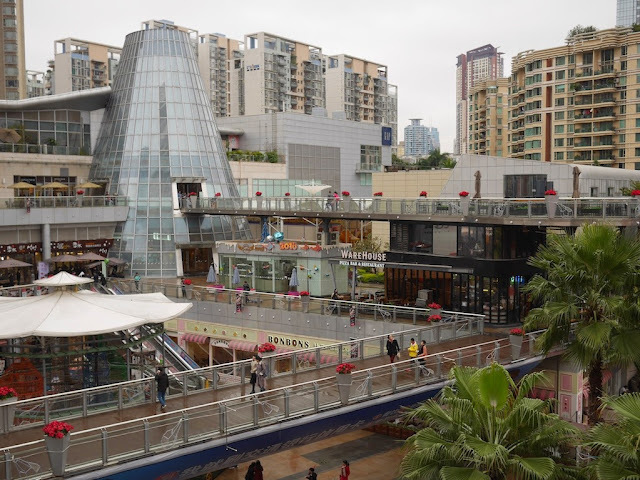 For a late lunch today in Shenzhen, I headed to the COCO Park — a trendy shopping mall with a number of restaurants. 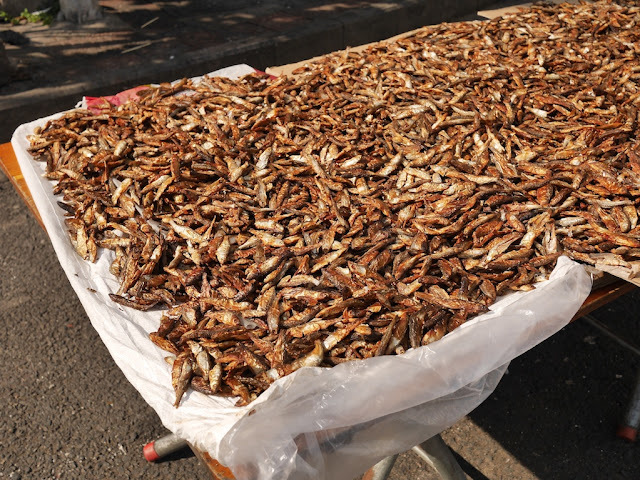 After all of the recent posts about donkey meat, I was in the mood to try something different. 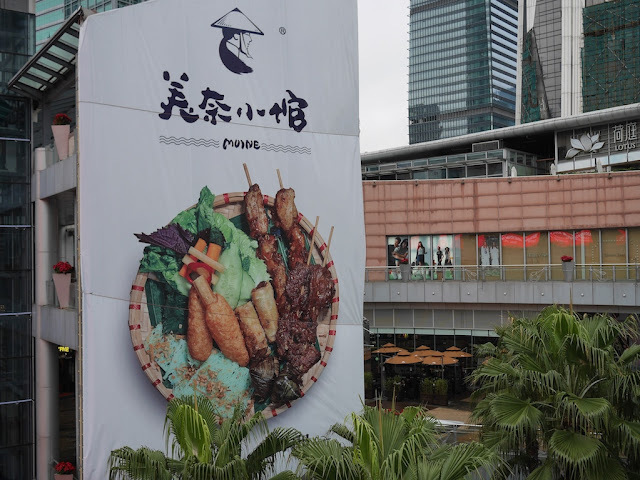 In the mall's central courtyard area outside, an advertisement for a Vietnamese restaurant tempted me. But the restaurant didn't fit the "different" category for me. 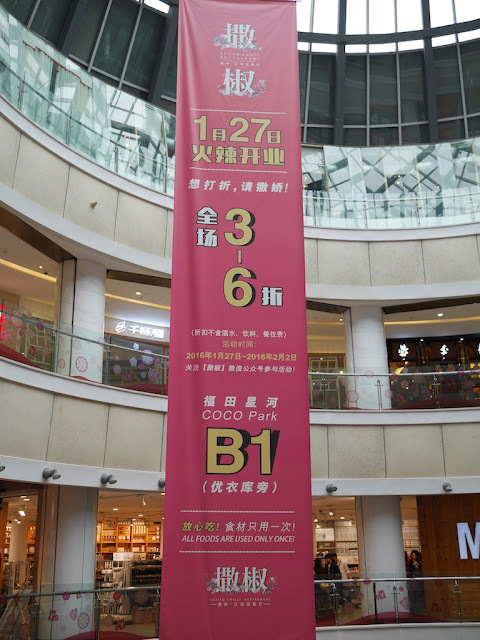 Inside the mall I saw a banner inside advertising the Sajiao Chilli Restaurant. It promised "ALL FOODS ARE USED ONLY ONCE!" I typically eat food which has only been used once. So, again, tempting but not different. Or at least I hope so. Next, from afar I spotted WareHouse. Their pizza was tempting too, but it still couldn't pass the "different" test. But I didn't have to give up hope on enjoying some pizza. Fortunately, I was able to find an appropriate restaurant next to a large sign promoting it. Like WareHouse, La César specializes in pizza. More important for today's goal, it specializes in a pizza I had never tried before. No, not donkey meat pizza (still haven't seen that). The main ingredient for their famous pizza is durian — a fruit that evokes a wide range of responses from people. Some can't bear the smell. 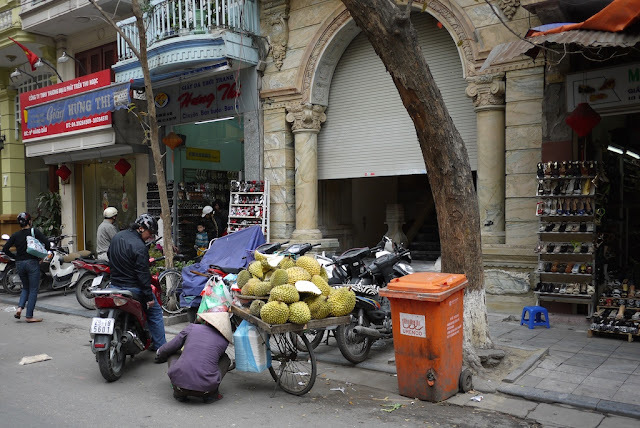 Some are attracted to the fruit so much they wonder if people have died from durian overdoses. I fall into the latter category, and someday I will write an ode, or perhaps just a post, about durian. Today is just for durian pizza. The restaurant allows you to order a pizza with two different toppings at no extra cost. So for one half I ordered the standard durian topping (there are pricier varieties of durian available) and for the other half I went for a black mushroom topping with tomato sauce (they have a number of other non-durian options as well). 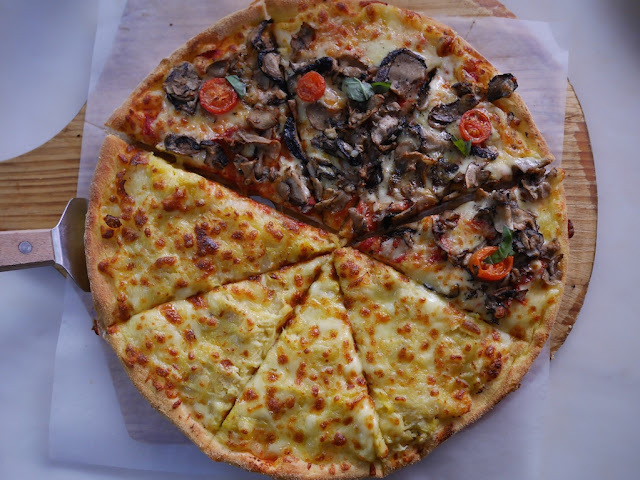 The half and half option is an excellent offering since the durian pizza is sweet and could serve as a dessert. One drawback is that the strong durian smell can coverup some of the smells from the other pizza. Ideally, I would want the durian half of the pizza brought out later, though it's hard to escape durian smells regardless since the durian pizza is a popular choice. The results? Keeping the dessert theme in mind, I started with the more savory mushroom side. It was good although more fresh basil would have been appreciated. The crust reminded me of Little Caesars in the U.S. The all-important durian side was pretty good as well. It works, though I'm not sure the cheese was really necessary other than for texture. Which leads to my common impression when trying durian ice cream, durian cookies, etc. I like them but often feel like I would be better off just eating a plain durian. If you like pizza and you like durian, the durian pizza will probably pass. As long as the half/half option remains, I can see myself returning someday. Tomorrow, I look forward to seeing whether leftover durian pizza works for breakfast.